Every Tuesday a group of the valley tasting room managers and assistants meet together to taste each others wine and see what each place has to offer. 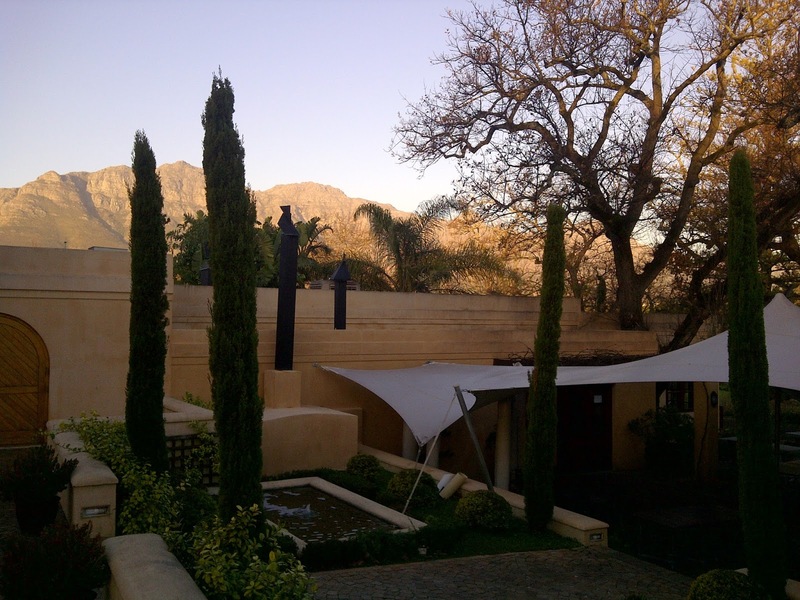 It is a great way for us to learn more about wine, get to know our neighbours in the industry and also to experience wine estates nearby so we can refer people to other estates based on our own experience. Today it was Blaauwklippens turn to host the tasting. They decided to do a Zinfandel tasting seeing as that is what they are well known for. 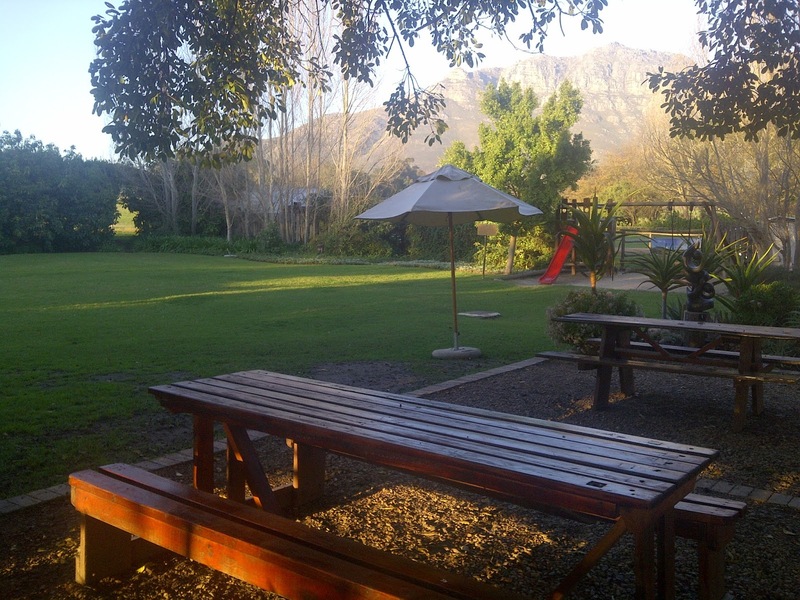 Blaauwklippen has a nice outdoor area where you can enjoy a tasting and they have a lawn with a childrens playground within sight of where you sit for your tasting. It is therefore child friendly. 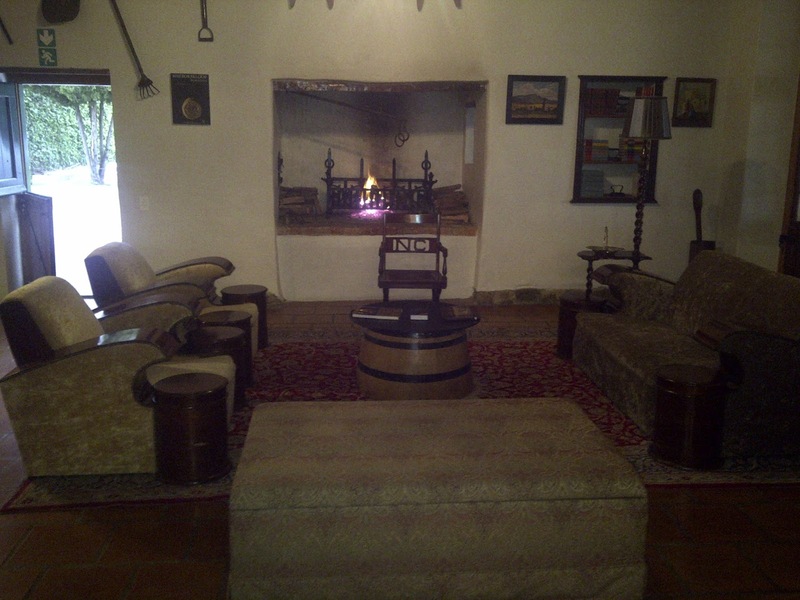 They also have plenty of seating inside and a fireplace for those chilly days. On Sundays they have a market on which I have heard is very popular and a lot of fun. 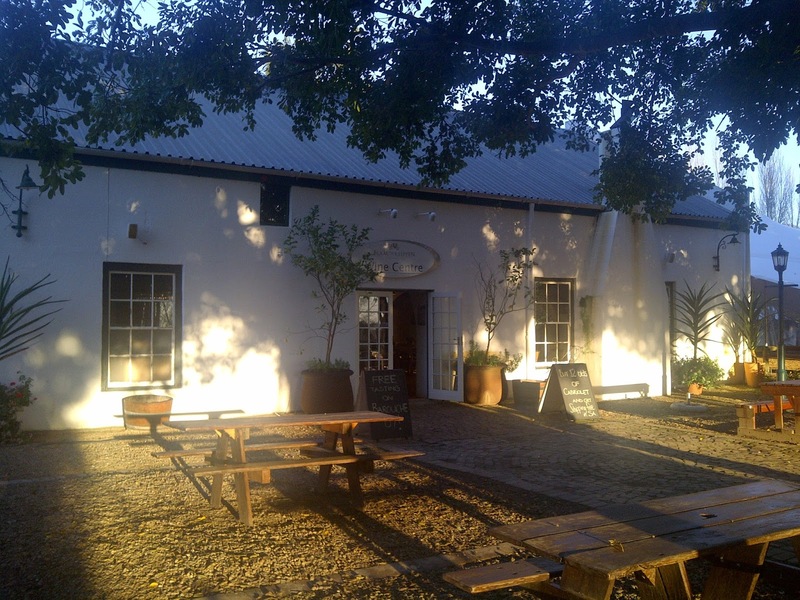 To do a wine tasting here costs R25 for 5 wines, R15 for 3 wines, R10 for dessert wine, R15 for 10yr Brandy, R10 for 8yr Brandy and R75 for a chocolate and wine tasting. The person who did the tasting with us was very informative, dressed professionally, she really knows the wine and has a great understanding on wine in general. She is truly an asset to the estate. We started with the White Zinfandel 2011 at R92 a bottle. This had tones of peach and apricot on the nose. It was smooth, fruity and very pleasant. It was a slight pink/salmon colour. It was recommended that one serves this with sushi or fish, and that it is a nice food wine. Zinfandel (red) 2007 at R92 bottle was a little dry, had a little white pepper, medium body, fruity, a slightly dry finish, slight acidity, the tannins could use a few years to soften up. I would recommend aging this wine further. This wine was recommended with cheese. Next we were very lucky to taste the Reserve Zinfandel at R310 a bottle which is not available for tasting. It had a gorgeous fruity nose, was smooth, and had lovely flavour. Don't worry about not being able to taste the wine just buy a bottle. You wont be disappointed. The fourth wine we tried was the Zinfandel Noble Late Harvest 2011 at R203 a bottle. This had raisin, prunes and dried fruit aromas. It was sweet without being syrupy. It reminded me of stewed fruit. It is smooth and rounded; it has a great round-mouth feel. It is yum!!! I loved this wine. 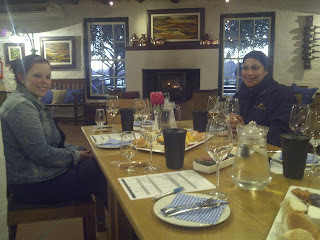 We finished the tasting with the Before & After Apertif N/V at R220 a bottle. The bottle alone is awesome enough to warrant buying a bottle. It is very stylish!! This wine was prety nice, it was smooth with a nice finish. It is 80% potstill brandy and 20% Zinfandel Noble Late Harvest. It is an interesting mix and I am not sure if I like it but it was interesting. I just don't think I like it enough to buy a bottle. 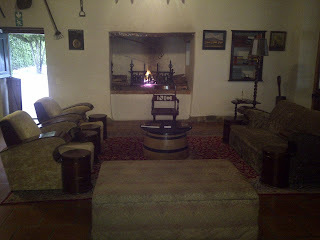 We had a very nice wine tasting experience here and I would recommend one visits this estate when in the area. I visited Blaauwklippen on the 19th of August in the afternoon. Marlin was serving me. He has grasped a good understanding of the wine within a short time of working there. I tasted the Sauvignon Blanc 2013 at R61 a bottle. This was acidic, fresh, had nice sugar levels, tropical fruit flavours with a bit of green capsicum (pepper). The Viognier at R61 a bottle was a nice light wine. The Chenin Blanc 2013 was light, crisp and has hints of apple. I also found it a bit gassy, like CO2 had been put in the bottle before closing it. The 2012 is nicer and better balanced. It was very fruity on the nose. 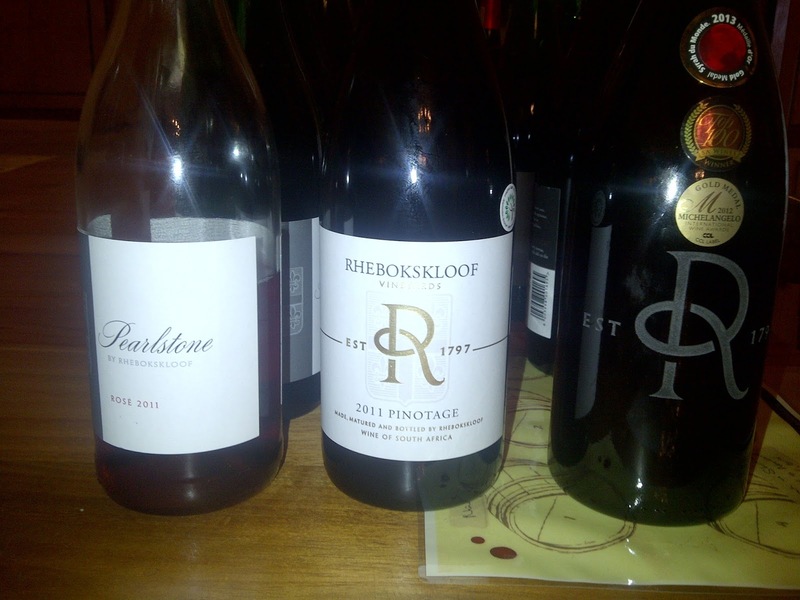 The Rose 2012 at R40 a bottle really stood out for me. It is a Shiraz Zinfandel. It is very nice, light and fruity. Nicely balanced. I bought a few bottles of this wine. The Cabernet Sauvignon 2010 (R66 a bottle) was ok, it has good potential but I highly recommend putting it away for a few years before drinking. I tried the Shiraz and the Merlot but didn't like either of these due to body, texture and taste. The Malbec 2010 was smooth and a little dry, it was ok. I tried the Viognier NLH 2012 which was lovely, smooth, fruity, full mouth feel, sweet but not syrupy. I liked this wine. 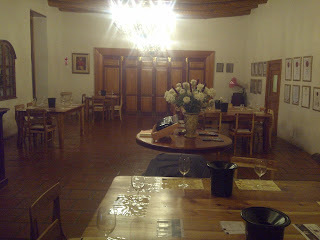 I also liked the Malbec NLH 2010; it was heavier than the Viognier, with a nice round mouth feel and was sweet and smooth. Today our valley wine club met at Bilton for a wine tasting. The Bilton building is a great size for big groups. They have plenty of parking to accommodate big groups also. The views on the drive up to Bilton are always stunning no matter if it is rain or shine. 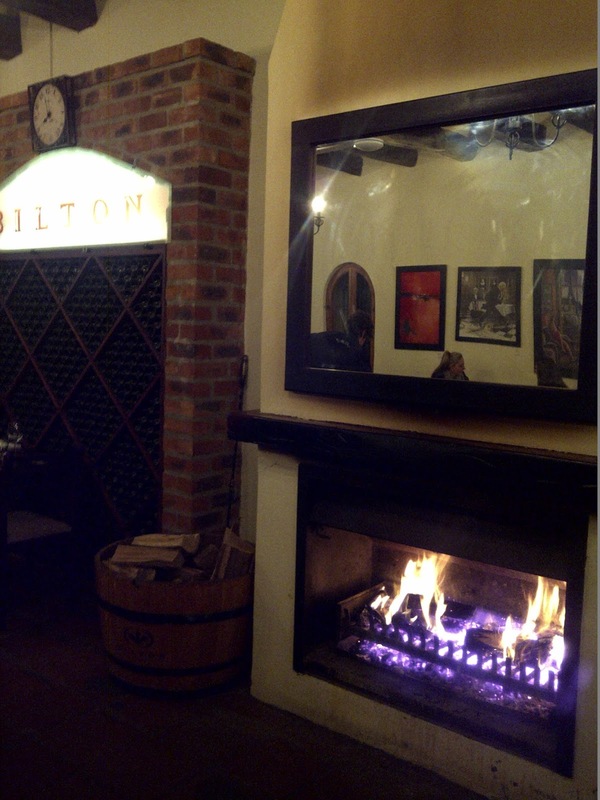 They have a lovely fireplace in the tasting room and plenty of heaters to warm the place up in winter. 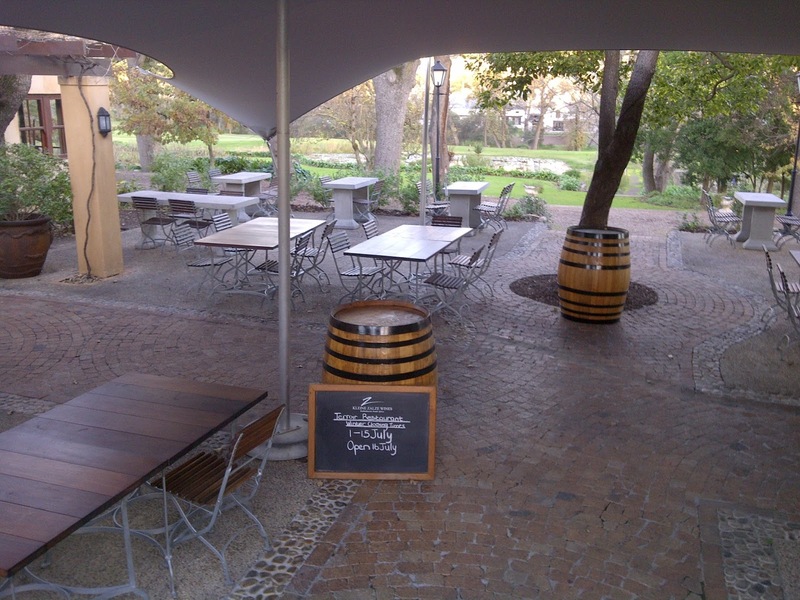 There is seating outside, so if you want to enjoy your tasting outside you can. This wine estate has a childrens playground and lawn area for children to play outside on, making it child friendly. Moira was the host for the evening, she has a great understanding of wine and was able to host a well presented wine tasting with the Bilton wine. There were several stories that came with the wine at Bilton making for an interesting wine tasting. Tonight we got to do a chocolate and wine tasting. I was looking forward to this as it was over two years ago since I last visited Bilton and also did a chocolate and wine tasting. You can see my last visit review on http://westerncapewineries.blogspot.com/2011/05/bilton-wines-helderberg-stellenbosch.html. It is funny to read my tasting notes then and compare them to what I have written now two years later. 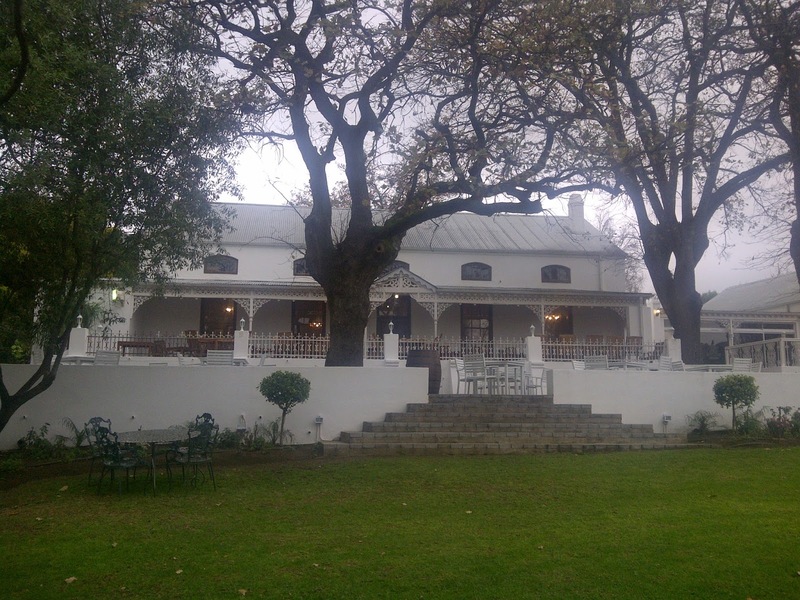 We tasted the Bonnie Anne Sauvignon Blanc 2012 (R59 a bottle). It smelled green, fresh and citrus on the nose and on the palate you taste the same; I could taste lemon, lime and granny smith apple. It also seemed fizzy on the palate, like Co2 had been put in the bottle. I didn't like this wine. This wine was paired with white lime and crispy apple chocolate. I found the chocolate to be salty and didn't feel it matched so well. The Cabernet Sauvignon 2008 (R99 a bottle) was beautiful on the nose; it smelled smooth, spicy and earthy. It was a little dry/rough and fruity on the palate. I found this wine was not balanced. I didn't like this wine either. This wine was served with dark espresso chocolate. The wine tasted more intense in fruitiness and was smoother after the chocolate. I think this wine might be best served with food. Merlot 2008 (R99 a bottle) had a strong fynbos and spicy aroma. It had great intense fruity and berry taste, it was smooth and very nice. I was very impressed with this wine, to the point that I purchased a case. I loved this wine. I gave a bottle of this wine to a friend and he let me know the other day that it was the best Merlot he had tasted! !This wine was served with Dark Cherry Malt chocolate. I loved the chocolate. It tasted like jelly (like the jelly in rocky road). I didn't like the chocolate with this wine. The chocolate seemed a bit salty. Shiraz 2008 (R99 a bottle) had a dark berry smell on the nose, it smelled nice and had a slight sweet aroma. Pleasant on the palate, smooth, light and fruity. I liked it. Pinotage 2009 (R99 a bottle) was very fruity, a little dry, a little rough on the palate. It had a strong smell. I didn't like the smell or taste of this wine. The Matt Black 2009 at R79 a bottle I didn't like. It had very dark flavours and herby/earthy smell on the nose. It semmed complex, like it had licorice or even marmite tones? It seemed to have tones of mint on the palate also. The Sir Percy 2008 had a nice cherry, fruity nose, was smooth on the palate, and had intense dark berry flavours. It was balanced and yet a little heavy. This wine was ok.
We got to taste the Viognier 2008 at R199 a bottle this had pungent stone fruit smells like that of peach and apricot. It was flat on the palate. It had a similar taste on the palate as it did on the nose. I didn't like this Viognier. Sadly it seems I am not a fan of the wine at Bilton, however their Merlot 2008 is fantastic!! 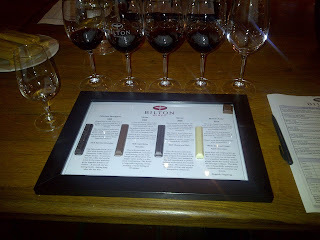 The chocolate and wine pairing is interesting and fun. If you go to Bilton then I recommend doing the chocolate and wine pairing. The service here is always good and you are always made to feel welcome. Please don't let my opinion of the wine put you off coming here. If you visit this region then I highly recommend visiting Haskell Vineyards, Rust en Vrede, Bilton, Alto, and Hidden Valley. They make for a great day out!!! 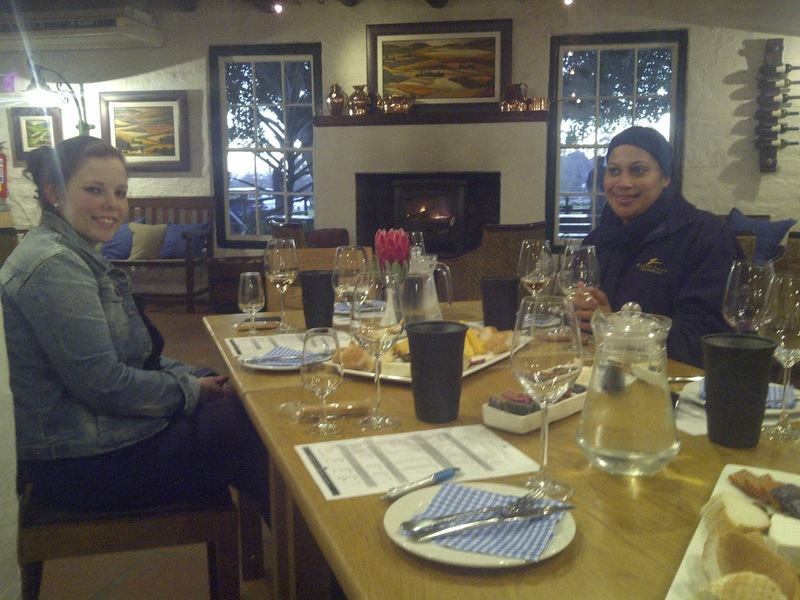 Today our valley wine club got together for a tasting at Kleine Zalze. 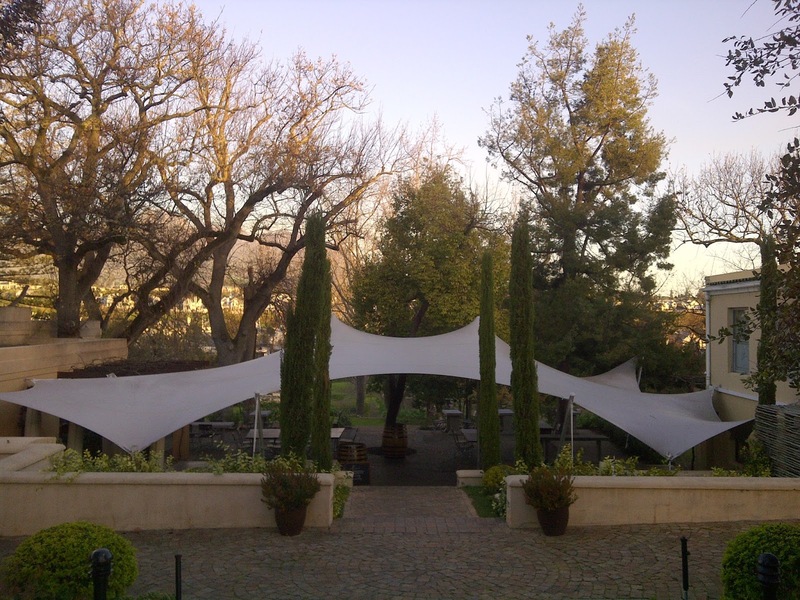 They have a lovely setting/location in Stellenbosch. There are beautiful views as you walk to the tasting room and restaurant. They have indoor and outdoor seating to suit all weather conditions. The tasting room manager and Wayne ran the tasting. 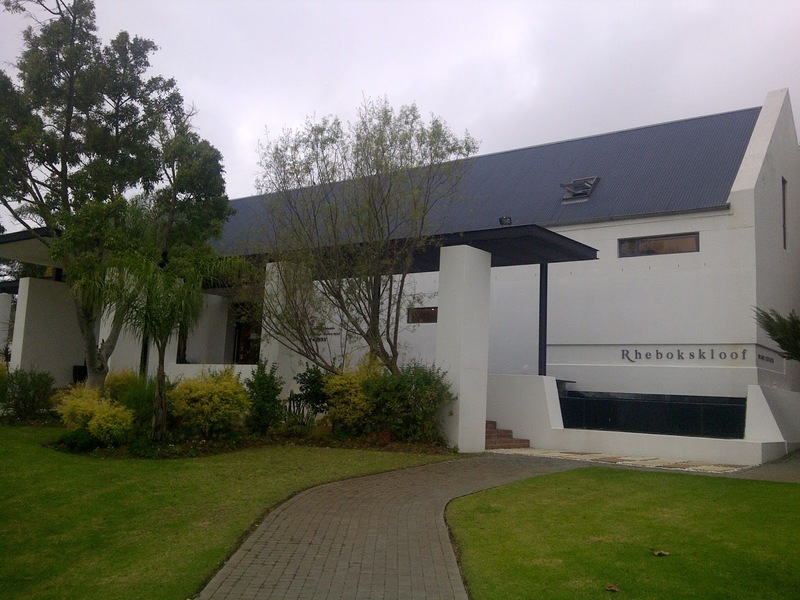 It was very informative, interesting and you can see that the team at Kleine Zalze are really passionate about wine and their job. It was a great wine tasting. We started with the Sauvignon Blanc Family Reserve 2011 at R130 a bottle. It has a strong aroma and flavour. It is very sharp with a nice strong lingering finish. Tones of lime and tropical fruits. It was very fresh. The Gamay Noir Rose 2012 at R45 a bottle was light on the palate and has an unripe strawberry taste. It is fresh, off dry and has a lingering finish. This wine had 12 hours skin contact. Chenin Blanc Bush Vine 2013 (R39 a bottle) has a beautiful nose - that of granny smith apples and tropical fruits. This wine was also fresh, with citrus, lime and lemon on the palate. It was a little sour. Chenin Blanc Barrel Fermnted 2012 (R70 a bottle) spent 7 months in 20% new oak barrels and 80% second and third fill. It smelled creamy on the nose with hints of butterscotch. On the palate I tasted dried apricots. I didn't like this wine. Cabernet Merlot 2010 is R55 a bottle. It was beautiful on the nose with hints of dark berries - specifically blackcurrent. It had an intense and spicy taste. It was smooth and easy drinking. I liked this wine. This blend was a mix of 65% Cabernet Sauvignon, 20% Merlot and 15% Cabernet Franc. 30% was matured in 2nd fill barrels and the other 70% in 3rd fill barrels. 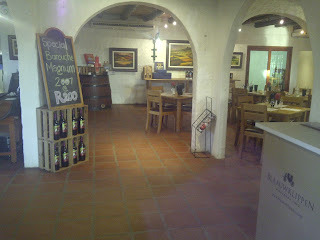 We then tried the Shiraz Mouvedre Viognier 2011 at R95 a bottle. It had a gorgeous floral and slightly sweet nose, was spicy and a little savoury on the palate. It apparently goes very well with pork. No new barrels were used, only 3rd and 4th fill barrels. I found this wine a heavier, more serious red with slightly dry tannins. Cabernet Sauvignon Barrel Matured 2010 at R100 a bottle tasted the same on the palate as it did on the nose. It had powdery tannins. It was smooth and accessible. Smelled of plums and tobacco. It is a heavy red wine. Ideal with food. This wine spent 16 months in 40% new oak, 30% 2nd and 30% 3rd fill barrels. 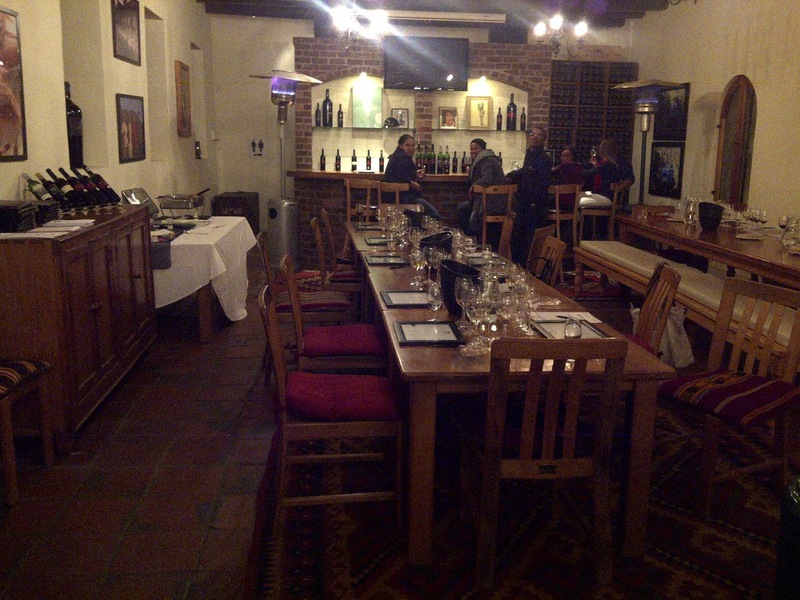 To finish off the evening, we were given a tasting of the Cabernet Sauvignon Family Reserve 2008 at R240 a bottle. This is not normally available for tasting so this was a real treat for us. It smelled high in alcohol and a little sweet with hints of aniseed on the nose. It was very fruity, smooth, a little spicy and a little dry. I think it is best to decanter or age this wine. It had great body and is very full of fruit flavours. We had a wonderful evening here at Kleine Zalze. The staff are very friendly and welcoming. Wayne truly is a character and will make your visit special and memorable. 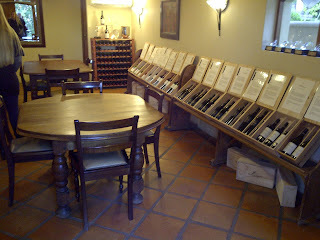 The wine is of good quality and they have such a range of wines to try!! 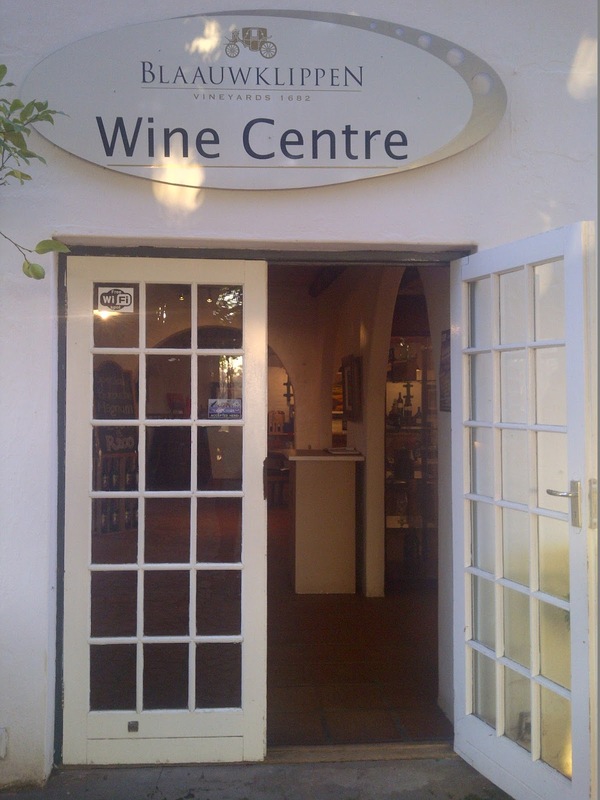 The interior and exterior of this tasting room is very nice and welcoming. I recommend visiting this estate. They have a restaurant here called Terroir. I haven't dined there but I have heard great feedback on their restaurant. The chef made a Thai green curry for us to enjoy after our tasting and it was truly fantastic!! It was authentic and truly the best Thai Green Curry I have had in SA!! I heard that this restaurant gets booked out well in advance in summer so if you plan to eat at this restaurant then book a few months in advance to avoid disappointment. 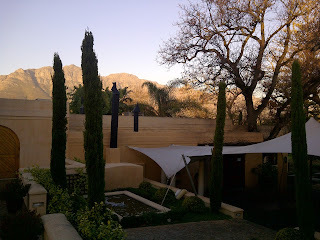 Today I stopped at Rhebokskloof for a wine tasting and enjoyed it very much. 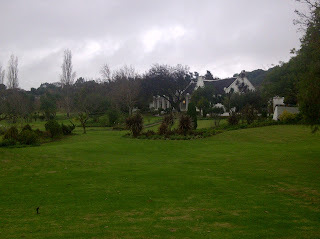 The grounds are just beautiful!! If you visit this estate be sure to take your time and have a good look around!! They have a restaurant, tasting room, conference centre, information centre, garden and childrens playground. 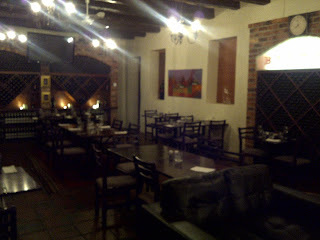 The tasting room has nice decor; it is very tasteful and inviting. Henrico was working that day and it turned out it was his first day so we sat down at a table and tasted the wine together, that was fun. 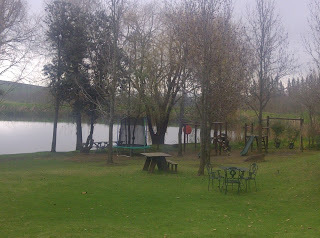 To do a wine tasting here costs R15 to taste 5 wines. Pearlstone Rose 2011 (R45 a bottle). It was sweet on the nose, had strawberry flavours, was pleasant, not too sweet/off-dry. It was nice. Pearlstone Sauvignon Blanc 2011 (R52 a bottle). Ttropical fruits on the nose, hints of pineapple and pear, it was light on the palate, easy drinking, and not acidic. It was nice. Estate Chardonnay 2012 (R79 a bottle). Smelled buttery on the nose, light on the palate, minerality and lime on nose and on palate, doesn't taste as buttery and creamy as one would expect from the smell, fresh on the palate. Estate Viognier 2012 (R75 a bottle). Granny smith apple on the nose, lovely fruity nose, smooth, balanced, lovely flavour, soft, hints of pineapple and orange, and stone fruits like peach and apricot . Pearlstone Cabernet Merlot 2011 (R65 a bottle) has a strange nose like fermentation/yeast smell. I didn't like this wine. It was a little dry and had a horrible taste. Pearlstone Pinotage 2010 (R65 a bottle). It smelled nice, fruity with hints of plum and berries, powdery tannins, light, ok, little dry. Pearlstone Shiraz 2009 (R65 a bottle). It had a nice aromatic nose, was light on the palate, smooth, will go good with red meat, it was ok.
Estate Shiraz, Mouvedre, Grenache (SMG) 2010 (R85 a bottle) is 60% Shiraz, 20% Mouvedre, 20% Grenache. Gorgeous nose, little spicy and fruity on the nose, smooth, little spicy, full mouth feel, lovely and easy drinking. Estate Pinotage 2011 (R85 a bottle), had slight fynbos aromas on the nose, was light on the palate, had nice light berry flavours, slightly herbacious, I think it will be better if it is decantered as it is a little dry on the palate (powdery tannins), it was nice. Estate Shiraz 2010 (R85 a bottle) had a very strong pepper/capsicum nose, it was medium bodied, and a big strong serious red with dry tannins. Black Marble Hill Reserve Syrah 2010 (R190 a bottle) had dark fruit aromas, blackcurrents, berries, mulberry, has good aging potential, best to decanter, had deep flavours, great balance and integration. I liked it. But it was a little dry. My favourite wines were the SMG, Pinotage and Shiraz. Overall, I had a good experience here. I would love to come back and try out the restaurant. With the playground not far from the outdoor seating of the restaurant, this is a great option for those with children. 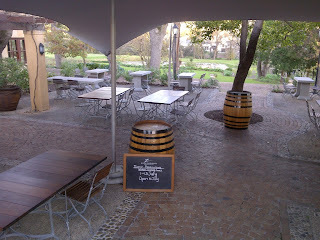 Today I held a winemaker's evening at Five flies. Shawn Thompson from Du Toitskloof was the guest winemaker for the evening. I felt this was light with berry and cherry flavours. It was pleasant and easy drinking. Was smooth and a little sweet. It is a blend of 60% Cabernet Sauvignon, 40% Shiraz and a bit of Malbec. It had touches of tobacco and cherry. Little nutty and spicy. I liked it. I felt it smelled heavier and fuller bodied compared to the last wine with stronger fruit flavours and spicy tones. It was yum but a bit more serious than the last wine. Again I liked this wine. This is a blend of 40% Cabernet Sauvignon, 25% Merlot, 5% Petit Verdot and 30% Shiraz. This wine has a beautiful fruity nose with a bit of coffee and vanilla. It had slight powdery tannins. It was a more serious wine compared to the previous two. This wine is Shawn Thompson Garagiste wine. I found it had powdery tannins and that overall it needed more time. I therefore recommend one puts this wine away for a few years after purchasing. It was yet another interesting result and a fun evening. 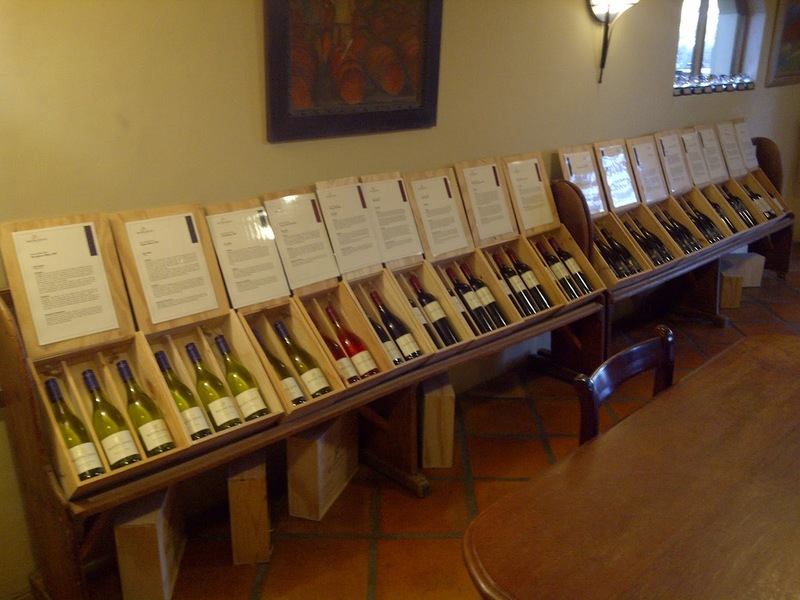 If you would like to join my wine club please email me on westerncapewineries@gmail.com.